We have an interview episode to tide you over until our next movie review show next week. 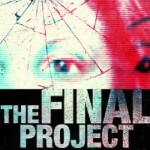 We interview Taylor Ri’Chard, director of the new film The Final Project. Taylor tells us about the plot of the film, and answers our questions regarding the found footage genre, horror film favorites and more! Be sure to check out the trailer below, and keep an eye out for this new film! Follow Taylor on Twitter and Instagram!